Intended for any use such as camping, hiking, traveling, or even for a keychain. Our 23KN Heavy Duty Carabiner is the most versatile utility clip on the market! Made from premium steel alloy and a safe twist lock system with a Min. breaking load of 5,000 lbs. Colors: Black or Zinc White - Min. breaking load: 5,000 lbs. 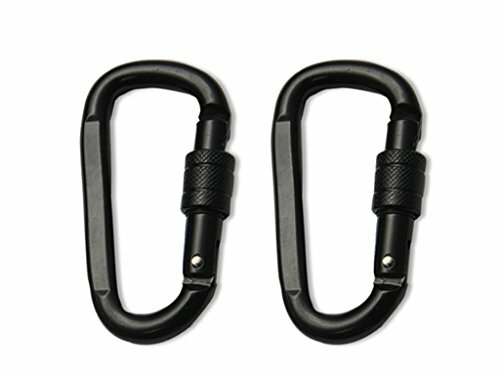 'Add to cart' to purchase the most reliable carabiner clip set on the market!! Or your money back! HEAVY DUTY - Each premium 23KN steel alloy carabiner clip will hold up to 5,000 lbs. included with a reliable screw lock system very convenient for any hiking or camping needs. SUPERIOR STRENGTH - When choosing the right carabiner you have to ensure it's quality that's why our carabiner is heat-treated to adjust the internal grain structure of steel alloy to greatly enhance our product's tensile hardness. ENHANCED SCREW LOCK SYSTEM - We stand behind our product's reliability we fulfill that with our enhanced screw lock system, this feature ensures carabiner is safe and secure to lock in place WILL NOT GET STUCK. WEATHER RESISTANT - Our versatile carabiner is good for indoor and outdoor use, surface treated in your choice of Zinc White or Black WILL NOT RUST. SIZE & WEIGHT - Each carabiner clip has a net weight of 146g and 4" in length suitable for any camping, hiking, or rope-intensive activities. If you have any questions about this product by PTO International, contact us by completing and submitting the form below. If you are looking for a specif part number, please include it with your message.